Beautiful, modern 1-bedroom apartment in the popular Jordaan area. This apartment is super bright, well maintained, modern and in a top location! - Suitable for a single person. 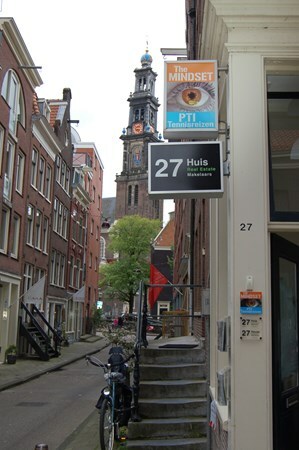 The apartment is located on a quiet street in the heart of the Jordaan! When you enter from the street you will arrive in a really nice communal space where you can have a drink or dinner with friends. From there you can enter the apartment where you will be amazed by how bright the apartment is. Because of the high ceilings and the skylight there is a ton of day light and at night you can watch the stars. The living room has an open, modern kitchen which is fully equipped and also has a washing machine. The door to the bathroom is situated off the living room. The bathroom is also very modern and has a sink, toilet and a shower. When you enter the other door from the living room you will find the bedroom. The bedroom has a raised bed with room for storage beneath. For more information or to schedule a viewing please contact Roos Pham: roos @ 27huis.nl or Dominique Groothuis: dominique @ 27huis.nl. You can also reach us on our office number: +31(0)20 428 07 21.